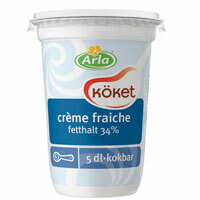 I use a lot of Creme Fraiche in my cooking and have translated it to "Sour Cream" wich is not exactly the same thing. In Europe, I think everyone knows what it is but I am not sure. When I found the foodblog for making Ghee I found a lot of good recepies and one is about making your own Creme Fraiche (click on the word "foodblog" and u get the recepie from the blog). In Sweden the Creme Fraiche contains 34% of fat but real cream contains 40% - according to LCHF, the higher level of fat it is in a dairy product or any food product, the better it is. I will try to make my own! Then I know what I get and hopefully I can make it fatter than the one in the stores. The taste would be nicer too, I hope. Not hard to do even if you think 8 hours is a long time. But just put it in water, in to the own on 50 degrees over night and it is done in the morning when u wake up!